Hunter’s is perfectly positioned to take full advantage of all that the Garden Route has to offer. Plettenberg Bay, South Africa’s premier seaside destination and the “Nature~Sport Capital of Africa” with its glorious golden beaches, is a mere 10km eastward, while the vibrant town of Knysna, nestled next to the vast Knysna lagoon, is 20km toward the west. And every which way the lush indigenous forests framed by the majestic Tsitsikamma mountains. For absolute peace and tranquility, venture no further than the Estate itself. 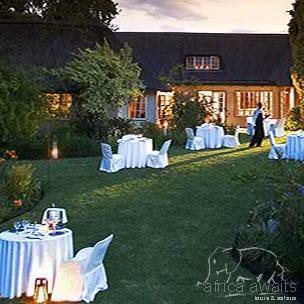 An old-world ambience permeates the thatched manor house with its antique-furnished lounges, candle-lit dining rooms and sun-drenched conservatory. Secluded within the gardens are 18 luxurious suites, individually designed and decorated, each uniquely distinctive. All have private patios and gardens, certain suites have their own plunge pools while all guests can enjoy the hotel’s large sparkling outdoor pool. Set in the magnificent gardens with a spectacular view of the Outeniqua Mountains, the recently built open-air Summer House provides an attractive alternative to the more formal dining rooms, offering innovative, informal meals with the focus on fresh wholesome cuisine. Sage Restaurant situated in the Manor House offers a fresh approach to a new cuisine experience with locally sourced ingredients to tantalise the taste buds. Aromatherapy, massage and reflexology are available on request in the privacy of guests’ suites. Hunter’s’ additional features include a Boardroom (fully equipped with audio-visuals) where fax, internet and e-mail facilities are provided, a Curio shop, and a private ‘Chapel in the Forest’ for weddings. There are also five golf courses within easy access of the Estate. Hunter’s’ superb gourmet cuisine, reflecting the rich diversity of South African cultures, is complemented by the finest Estate and prized Auction wines from the extensive cellar. 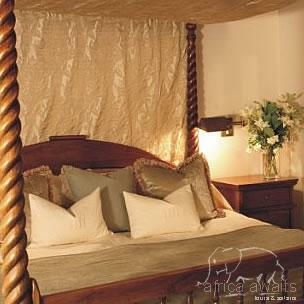 Perfect for a romantic honeymoon, Hunter’s also provides the ideal escape for a family holiday. Unlike many establishments of this caliber, Hunter’s welcomes and caters for children of all ages. The new two-bed roomed Family Suites provide spacious accommodation where the whole family can truly relax in their ‘home-away-from-home’ and the Summer House is the perfect venue for informal family meals, or where younger guests can enjoy delicious wholesome food while parents savour several courses in the elegantly appointed Sage Restaurant. Cubs’ Corner, where younger children are minded by trained staff, is a dedicated children’s recreation area with paddling pool, jungle gym, shaded sandpit, video / TV / games room and dining room. (See attached Child Policy). An entertainment area geared to older children is envisaged for the near future. The region enjoys the most temperate climate in South Africa with summer extending from October through to April. In mid-summer the days are gloriously long with the sun setting around seven-thirty in the evening. Winter days are generally mild but nights can be refreshingly cool. 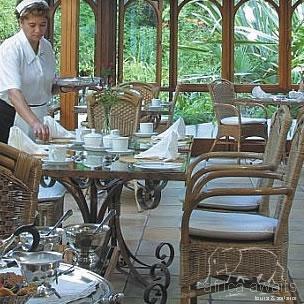 With your holiday, safari or business trip from in to Hunter's Country House in The Garden Route.